Electronic locks have been around for some time, offering a range of different choices and options for securing doors. In the past, these locks have had their fair share of criticism due to battery life issues and their costs, but their usage is still growing. The benefits of electronic locks range from allowing users to avoid carrying keys (and dealing with the drama of losing them), as well as providing an added sense of security. Many people have left their houses or offices only to wonder later whether they remembered to lock the door. Alternatively, sometimes one wonders if the kids locked the door when they left the house? With an electronic lock, you can use your smartphone app to check if the door is locked, and lock it (for them) if necessary. You can also unlock the door over the Internet, again from an app, when someone arrives that doesn’t have their own access. From a business perspective, centralised control means that a lock or any number of locks can be controlled from a central console, allowing administrators to grant or deny access as required. Cards, fobs or PINs can be assigned and revoked in seconds, and let’s not forget that biometric access is also built into many electronic locks. 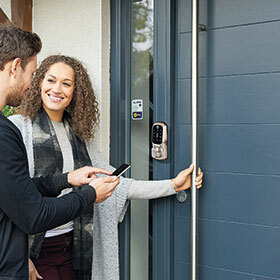 Of the many companies promoting their range of electronic locks in Africa, for home and business use, Hi-Tech Security Solutions spoke to SALTO and Yale to gain further insight into electronic locks and what they offer users today. As noted above, this enables Yale users to check the status of their door, issue lock and unlock commands, and even control who has access. For example, Jones says you can issue a user code or RF tag to your domestic and only grant access for certain times and days of the week. If the worker should leave, you can simply revoke the user access to your property via your smartphone or lock. But can they survive Eskom? Whenever we deal with electronic systems in South Africa, one needs to consider the implications of what would happen when the electricity fails – sadly, it is a case of when and not if. Electronic locks are fitted with batteries that have a reasonably long lifespan, but what happens if they die or something breaks in the keypad or RFID reader? Nevertheless, if the worst happens, he says SALTO has two ways to override the door and replace the batteries on the safe side. First is to use a portable battery pack, each SALTO product has three holes on the reader head where the unit can be inserted to provide power from the front, but then, for security, you still require a valid card to open the door. Once inside, you can replace the batteries in a couple of minutes. The second solution is to use a Portable Programming Device (PPD) to power the lock in the same manner, but also open the door through the emergency opening, all of the above is also audited for reporting purposes. In terms of security, Du Toit adds that SALTO products remain secure if the power fails or the product is damaged, meaning the door will remain closed for security reasons, unlike a magnetic lock that will leave the door open. The ability to manage locks via mobile apps is mentioned above, but as in all access control software platforms, there are more options than simply locking and unlocking the door. Yale offers an Internet-based hub and when paired to its Smart Living HOME app. Jones says, “This enables a user to either add Yale Smart Locks (only), or to experience the full Yale home automation security experience. SALTO can operate on Android and iOS mobile devices using BLE or NFC technology and its JustIN Mobile and SALTO KS application offers a number of features to give more options to users that do not want to carry a card – although users can use both mobile and card if they choose. • Our application allows for multiple keys. One app can receive many secure access credentials from different companies integrated with SALTO hardware. No need for multiple mobile applications or erasing and adding the one I want to use now. • Bi-directional communication. This means we don’t just send info to the user but also receive his transactions and status back. I can also revoke access immediately or change an access plan on the go (for instance if someone loses their phone or receives a new handset). We also allow for a picture of the site, contact number, GPS locations and a short message to be stored in the application. This creates a user friendly experience and makes it easy to contact and navigate to the property. • Remote openings through SALTO KS. Open the door to your office remotely for a guest to enter. Access alerts with CCTV integration and pre- and post- event video on your mobile wherever you are. Block access from your mobile phone, or put it in office mode to act as a normal door during office hours. SALTO also makes an API available for companies that wish to integrate with its hardware, but use their own mobile application. A critical aspect to any set of locks, electronic, mechanical or a combination of both, is the ability to support rapid exit functionality in case of emergencies. Do electronic locks support the necessary emergency exit procedures? The answer is yes. Du Toit says electronic locks can be wireless online and be integrated with the fire system, similar to conventional access controlled doors, but SALTO also offers emergency exit door integration through the push or touch bar. This means the door is part of the access control system and can be monitored without having to cable the door. To end the article, we asked both companies what their latest products are and what we can expect from them in the near future. SALTO will launch its new wireless blue gateways and nodes late in 2017. This gives any BLE-enabled smart lock the ability to connect to the network and be online through its Bluetooth connection instead of using wireless. Traditionally SALTO has used 2,4 GHz wireless connectivity to connect to its devices. “Our management platform has also been redesigned to be 100% HTML5 compatible and version 4.1 of the software can now also interface with smart elevators from Schindler, making lift control cable free,” says Du Toit. 30 minutes, the device will be motorised and can lock and unlock the door for you, and there will also be a small controller for gates and garage doors. It is also integrated with Air B&B and home automation systems through ZWave with further integration into SALTO KS coming next year.